BUT NOW, we have this glorious baby burrito. You know the ones you get from Chipotle that are so perfectly wrapped in the shiny foil and are roughly the weight of a newborn child? 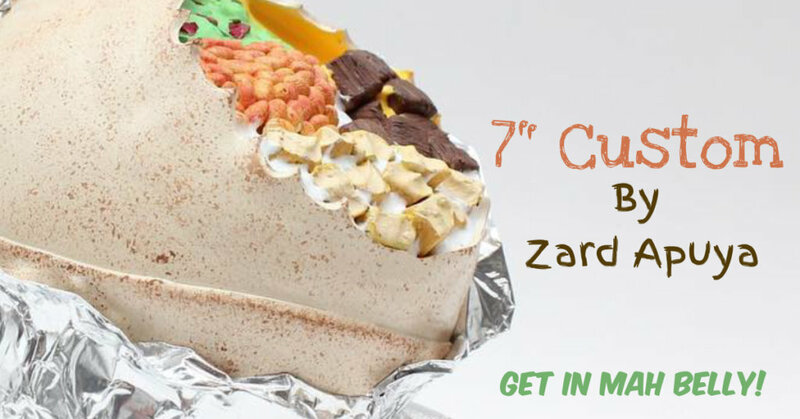 Don’t worry – with this burrito, guac is NOT extra. Hah! Looks like Zard ordered Chicken, Steak (everyone knows just picking one protein is absurd), pinto beans, queso, and guac. All of this is neatly packaged in the perfectly pocked and wrapped tortilla and perfectly nestled in the foil. I love this dunny, can you tell? This dunny is not the first of its kind, however. In April of this year, he released a Chipotle Munny in a similar fashion. If you’re interested in more of Zard Apuya’s work, check him out HERE on Instagram and HERE on Facebook. This 7″ dunny is available HERE for $175 along with a ton of other EPIC creations.